Deep in Siberia’s Taiga forest is Vissarion, a cult leader who looks like Jesus and claims to be the voice of God. He’s known as “the Teacher” to his 4,000 followers, who initially seem surprisingly normal. Over time, however, their unflinching belief in UFOs and the Earth’s imminent demise made this group start to look more and more like some sort of strange cult. Click here to read the article. Formerly a sailor called Wayne Bent, Michael Travesser is the leader of a cult in New Mexico called Strong City. His 56 followers – men, women and children – hang on his every word, serving him with absolute and unquestioning devotion. They say they are all preparing for death, to go to a better place as Michael claims his days on earth are numbered. 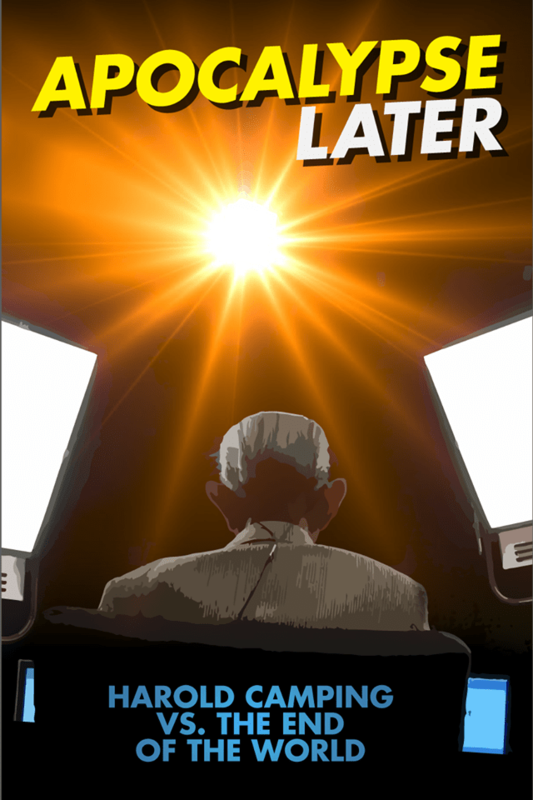 “There is no possibility that it will not happen!” Christian radio evangelist Harold Camping sounded the alarm. May 21, 2011 was to be Judgment Day, God’s intervention into our worldly affairs. The billboards declared, “The Bible guarantees it!” From where does this Apocalyptic excitement originate? Apocalypse Later traces the roots of end times predictions from the Book of Daniel to the historical Jesus and lastly to Paul, the greatest of the Apostles. The same excitement that Harold tapped into for his May 21st prediction is the same excitement that helped birth a world religion 2000 years ago. For two weeks leading up to May 21st, filmmaker Zeke Piestrup was granted full access as the only journalist to speak daily with Harold Camping. The up close portrait is juxtaposed with commentary from three giants of biblical scholarship: Bart Ehrman, John Collins, and Loren Stuckenbruck. From Mark 9:1 to May 21, the end is coming right now! Or, perhaps a little later. BBC reporter John Sweeney’s last investigation into the Church of Scientology resulted in an explosive confrontation with church officials. This time, in a Panorama Special, one of those officials has turned whistle blower to help him reveal the dark secrets of the church, which boasts Hollywood A-listers Tom Cruise and John Travolta among its devotees. Along the barren canyon lands of the Arizona Strip lies the remote polygamous community of Colorado City. The Fundamentalist Latter Day Saints, or FLDS, have thrived here for over half a century in perceived peace and harmony. Under the leadership of self-proclaimed prophet, Warren Steed Jeffs, have disturbing accounts of rampant emotional, physical and sexual abuse begun to emerge. Warren Jeffs serves a jail sentences in Utah. This is the story of some of the survivors. 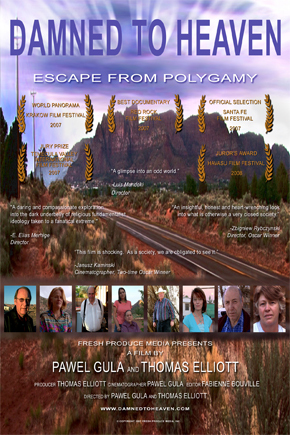 A 2010 documentary film featuring a behind-the-scenes look into the lives of teenagers exiled from their families and community by Warren Jeffs, self-proclaimed prophet of the Fundamentalist Church of Jesus Christ of Latter Day Saints (FLDS Church). Sons of Perdition premiered at the Tribeca Film Festival in New York on April 24, 2010, having sold out at the box office within one hour from the time tickets went on sale. “Sons of perdition” is a term used by some Latter Day Saint denominations, including the FLDS Church, to describe members of the church that have committed the unpardonable sin. Directors Tyler Measom and Jennilynn Merten followed these Lost Boys for four years to bring to the film the personal perspective of the exiled boys. We followed the story of the Westboro Baptist Church as families split and children were brainwashed into picketing funerals and bashing homosexuals. During that time, we interviewed more than a dozen members of the reviled group, including some of the only members not related by blood, the Drains. They welcomed us into their homes and gave us access to 17 years of home video footage. In return, we produced an unbiased look into the lives of one of America’s most despised organizations. Watch part 2 here. a TV documentary written and presented by the BBC’s Louis Theroux about the family at the heart of the Westboro Baptist Church. At the heart of the documentary is the Westboro Baptist Church (WBC), headed by Fred Phelps and based in Topeka, Kansas. It runs the website GodHatesFags.com, and GodHatesAmerica.com, and other websites expressing condemnation of LGBT, Roman Catholics, Muslims, Jews, Sweden, Ireland, Canada, The Netherlands, and other groups. Following up on his hugely popular and acclaimed 2007 documentary, Louis Theroux returns to Topeka, Kansas, for a second visit to the Westboro Baptist Church. A documentary about 13-year-old Deborah Drapper, who, unlike other British teens has never heard of Britney Spears or Victoria Beckham. She has been brought up in a deeply Christian family and her parents have tried to make sure she and her ten brothers and sisters have grown up protected from the sins of the outside world.